Lateral deltoids are important muscles which are located on top of your shoulders. These are often said to be the most neglected muscles in spite of their immense importance. These shoulders play a crucial role in assisting external and internal rotation. These muscles are important to train for bodybuilders and weightlifters so that they do not suffer from fatigue when they workout for long hours. When you exercise to strengthen and add power to the lateral deltoids, you are able to improve muscle growth, health and overall balance of your shoulders. 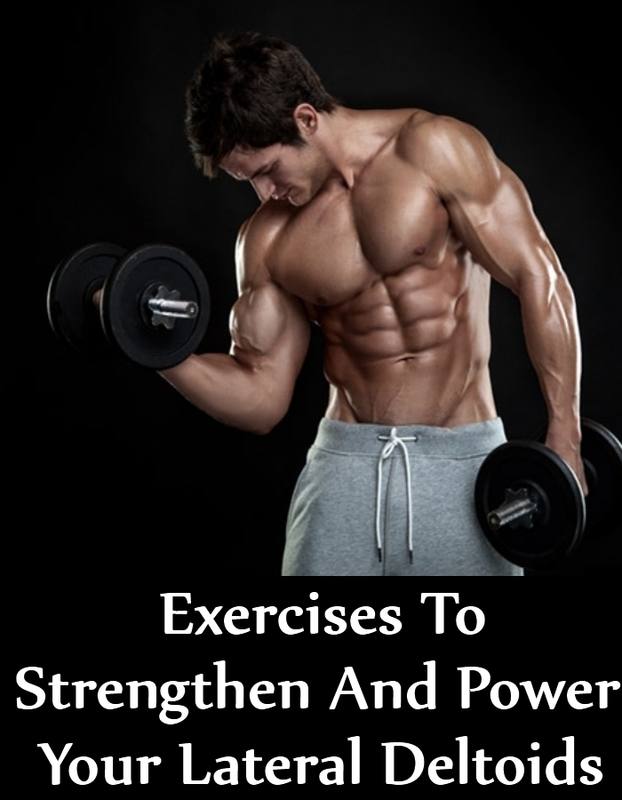 Include these exercises at least thrice in a week, in your workout schedule. Start by holding a barbell. Your hands need to be a little distance apart from one another – preferably shoulder width. You need to hold the barbells with your arms, straight down and in front of the body. Keep the bar close to the body. Your arms shall be bent and then slowly lift the bar. Let the elbows do most of this movement. You can complete the barbell at the level of your shoulders. Your elbows need to be positioned a bit higher than this bar. You need to slowly put the bar down. You can do this exercise on a Smith Machine. This is an effective exercise which helps in targeting all the difficult lateral deltoid muscles. Start the exercise by sitting comfortably by the edge of a bench. Your feet shall be placed on the floor firmly. You need to place these dumbbells in the space which is just on the bench and feet. This will be your start position. You need to hold this dumbbell as you have your palms facing in. Your arms shall be straight down by your sides and at the length of your arms. You will not be swinging at this point but lifting the dumbbells by your side with a little bend by your elbows. Your hands shall be tilted a bit forward. You need to ensure that the arms are totally parallel to the floor. You can again lower these dumbbells and have them back to the start position. You will inhale in this position. This exercise is about a shoulder rotation which helps in exercising the deltoid muscles, mainly the lateral deltoids. To do the workout, you need to sit down comfortably on a bench with a good vertical back support. You need to hold on to a 10 or 20-pound dumbbell in your hand. Now, slowly press the dumbbell overhead, as your palms face forward. When you start bringing the arms down, you will rotate the arms internally, as the dumbbell reach the chest level. Your palm will face your body. You need to keep the elbows tucked in and keep them by your sides. You need to press the dumbbells back and up. You can again rotate the arms externally, as you move the weight upward. You can finish the workout with your arms extended and by keeping your palm forward. You will need a maximum lift for this workout. You will also need a spotter so that you have a good form. You need to bring your dumbbell up, to your shoulder height by each side. You will slowly rotate your wrists in this position, but do not exert your too much. This will ensure that your palms are facing a bit forward. Now, you can gradually push the dumbbells up, till your arms are able to reach out a lockout position. Beginners, should do this under a guidance or gradually without causing too much exertion You can again get back to the starting position as you slowly inhale. Do this workout 5-7 times as you start the routine. Start the workout by holding a 5 to 15-pound dumbbell in your hand. You need to be in a comfortable position with a dumbbell which you are comfortable with. These dumbbells have to be by your sides as you start the workout. Your palm shall face the mid-line of the body. 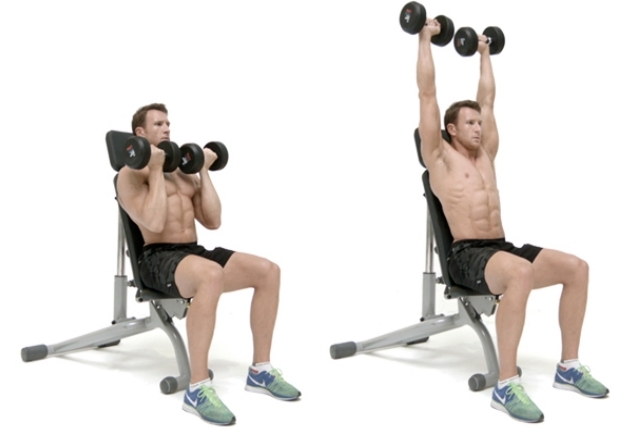 You will slowly raise these dumbbells laterally, with a bit of bend in your elbows. You will be moving to your sides, till the arms are at a horizontal position. You will again lower them slowly back and get them down to the start position. At this time, your arms shall slowly rise by the sides of the body. They should be a bit forward. You should be able to see the arms in peripheral vision. This workout shall help in reducing all shoulder injuries.